Johannesburg - Aaron Phangiso has been confirmed as the captain for the Highveld Lions for the RAM SLAM T20 Challenge. Phangiso, who led the team to the play-offs in 2016, is quietly confident in the team’s chances heading into the competition. "The Sunfoil Series has been a humbling exercise with the guys. Many hours on the field, many draws but a great opportunity to hone our skills," he said. "We are very ready to head into the shortest format of the game – my team is hungry and having the likes of Kagiso Rabada, Dwaine Pretorius and Bjorn Fortuin in your bowling arsenal is a dream for any captain. Add to that the batting skills of Rassie van der Dussen, Mangaliso Mosehle and we have everything we need to challenge our opponents for the silverware." 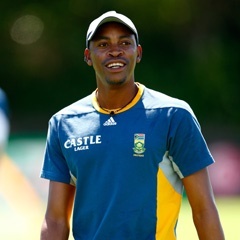 The Lions Cricket Board have been encouraged by Phangiso’s performance as captain in his inaugural outing in the previous edition of the competition. "Aaron has shown that he can lead the team in a decisive and confident manner. We are confident in our decision to support him for this competition and he is aware that we want to see a high level of execution of his skills," said Highveld Lions Chairman, Monyane Nkagisang. Head coach, Geoffrey Toyana, is excited by the young inclusions in the squad. Players like Ryan Rickelton (GCB Strikers) and Janneman Malan (NW Dragons) have been included. "The development pipeline of the Lions’ shareholders is exceptionally strong and we are spoiled for choice. These players are showing a lot of promise and we look forward to giving them the opportunity to experience the team environment as well as show their skills," he said. Aaron Phangiso (captain), Rassie van der Dussen, Reeza Hendricks, Mangaliso Mosehle, Dwaine Pretorius, Nicholas van der Berg, Wiaan Mulder, Kagiso Rabada, Marques Ackerman, Omphile Ramela, Bjorn Fortuin, Beuran Hendricks, Hardus Viljoen, Ryan Rickleton, Wihan Lubbe, Carmi le Roux and Janneman Malan.